There was not much to celebrate in the baseball element of Ken Griffey Jr.’s 40th year in life – and 22nd in the Major Leagues – as his .184 batting average, zero homeruns and spotty/erratic playing time have left The Kid with time to snooze and reflect on his Hall of Fame career. Far superior career eulogies will be written than what you’ll read in the space/time allotted here, so permit YKI to reflect fondly on the impending finality of the chapter entitled My Generation’s Baseball Heroes. Along with Frank Thomas, the sport has lost perhaps the only two offensive juggernauts of the 90’s who escaped the stigma of The Steroid Era. 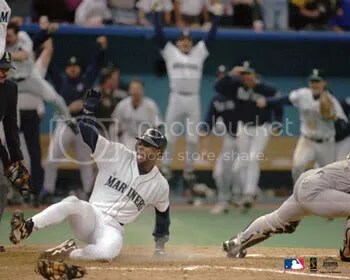 Griffey’s career spanned four decades, providing copious highlights, gems, lasers and bombs to fans throughout the world, who marveled at the growth & maturation of June-Bug. A list of Griffey’s greatest moments as a Mariner is presented here, apt insomuch as despite productive stops in Cincinnati & (south side) Chicago, Jr. will always be remembered as a Mariner. The back-to-back homeruns with his father, the dash home versus the Yankees, his countless Gold Glove catches. . .defined baseball to a generation further sidetracked by the more action-laden basketball & football, always reminding us that the Summer belonged to the Kids. over 800 home runs. Definetly a 5 tool player. I wear the swingman Ken Griffey Jr cleats. But he is not the best player of our generation. He was always injured. Most Homeruns (630) by a player who never played in a World Series. Bonds was the greatest player. More MVPs a WS apperance. I don’t remember any highlights from his days in Cincinnatti. Except the one when he’s on the ground clutching his knee. He never dominated a game like Bonds did. Fun to watch at bat or in the field! Could do it all. Hit, run, field and throw. A true 5 tools player!